If you needed to find me on any given day during my sixth-grade year, I was probably reading Percy Jackson and the Olympians. Percy (like many youths) struggles to understand the rapidly changing world around him while also trying to discover his own identity. Percy Jackson’s story helps ease everyday life for many kids by providing an escape to an impossible reality that mixes mythology with the elements of normal teenage struggles. Of course, Percy’s identity crisis is much more than that of any ordinary middle schooler, for he becomes immersed in the world of Greek mythology and must quickly adapt as he is sent on his first quest. It may seem bizarre, but Percy’s journey is one that is important for all ages to see and understand. 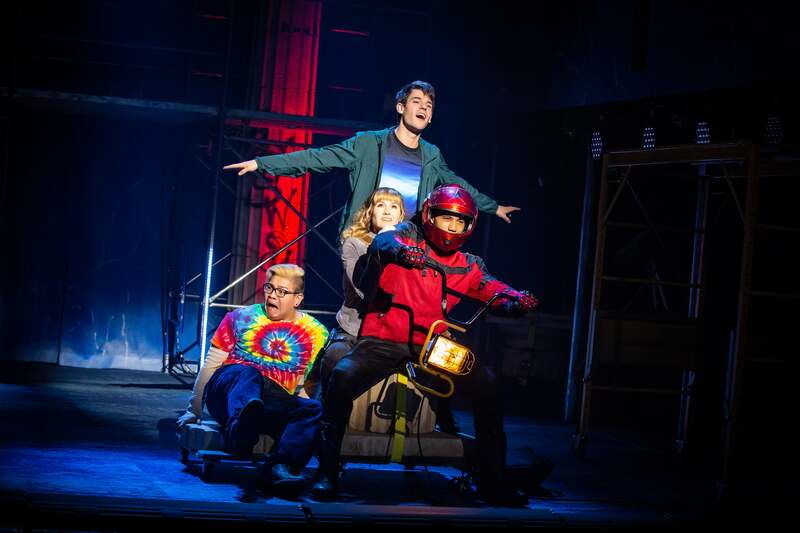 Under the direction of Stephen Brackett, The Lightning Thief: The Percy Jackson Musical takes to the stage on its first tour to deliver this same story to theater-goers across North America. Upon entering the Knight Theater, the feelings of a twelve-year-old boy rushed back to me as the sounds of thunder and flashes of light overtook the room. The show begins with a crack of thunder and an announcement that the Greek gods are, in fact, real. The Lightning Thief is an immersive and exciting experience from the start. Percy (Chris McCarrell), a young demigod with ADHD and dyslexia, is expelled from his sixth school and is taken by his mother (Jalyn Steele) to Camp Half-Blood, a place designed specifically for the children of the gods to stay safe. In his new summer camp, he is exposed to his first god, Dionysus (Jorrel Javier) in an intimidating encounter that only leaves him with more questions about his true identity. McCarrell’s portrayal of Percy is incredibly important for both adults and children alike to watch; he carefully balances Percy’s external and internal developments in a manner that shines a light on the coming of age struggles many youth encounter. Not to mention the significance of accurately portraying learning disabilities on the stage. After receiving a prophecy from an oracle and a sign from the gods, Percy embarks on a quest to prevent a war between the gods with Grover (Jorrel Javier) and Annabeth (Kristin Stokes). Annabeth is especially notable, for she is not merely a side character that assists Percy but a fully developed character navigating her own path. Kristin Stokes does not neglect Annabeth’s complexity and brings the sassy and adventurous character to life in a way that establishes a much needed positive female influence on the stage. Alongside the incredible lighting design of David Lander, Brackett’s creative direction makes our heroes’ quest engaging in every way. The show closes as Percy decides that he is ready to take on the challenges of the real world and create change. The message that the young Percy Jackson embodies may seem simple, but it is a glimmer of hope for anyone in the midst of struggle. The Lightning Thief is a reminder that the lessons we learn from the difficulties in our lives have the power to shape us into forces of change when we allow ourselves to learn from them. This review would be incomplete without an acknowledgment to the diverse acting abilities of Ryan Knowles as he tackles characters ranging from Chiron to Medusa. Knowles evokes constant laughter through his spectacular comic timing and surprises the audience with each new personality. Overall, The Lightning Thief is a positive reminder to embrace your identity, tackle every challenge, seek help when necessary, and care for those who are a part of your journey. This show is much more than an adaptation of a children’s story, but a beautiful and hilarious production that emphasizes values that are now more important than ever. I’m not sure that the Greek gods are real, but the theater gods responsible for this well-crafted piece most certainly are.